Invite your friends to use the Amazon Shopping App. We will give your friends a $5 coupon to shop at Amazon. We will also give you a $5 coupon, when your friends make their first purchase in the app (currently in US only). Here's how it works: open the Amazon Shopping app and log into your account. Open the side menu and scroll down to the "Personalized content" sub-section, then tap "Invite Friends." You can then invite people from your standard contact list, or just send them a code. They'll get $5 to use in their Amazon account, and if they download the Amazon app, then use it to make a purchase (as long as they haven't bought anything from the app in the last 12 months, per the terms and conditions of the promotion), you'll get $5 too. As noted above, the promotion is only good for users of the US version of the Amazon store. Sorry, international readers, it's not our fault. 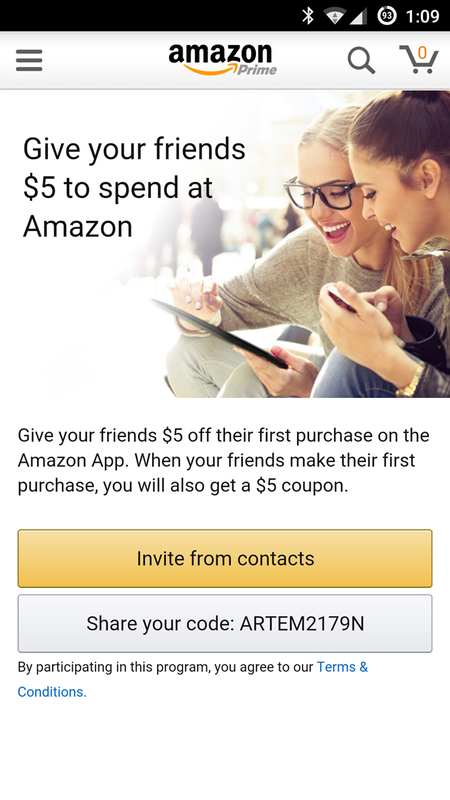 Do you want $5 of Amazon credit, but you don't have any friends? Use Artem's code (above) and download the app. Here's the text for the refferal link: https://amazon.com/mpr?referralcode=ARTEM2179N&ref_=mpr_tr_ss. We promise he'll use any credit he gets for the good of the site, probably in the form of hard alcohol. The download should be disseminating through the Play Store now, but if you can't get it for whatever reason, the latest version of the app has been uploaded to APK Mirror. These Amazon App Referral Program (the “Program”) Terms and Conditions are in addition to the Amazon Conditions of Use, to which you agree by using the Amazon App or Amazon Shopping App for iOS, Android, or Fire OS (the “Amazon App”). To the extent the Amazon Conditions of Use are inconsistent with these terms, these terms will control with respect to the Program only. We will make all determinations under the Program in our sole discretion. 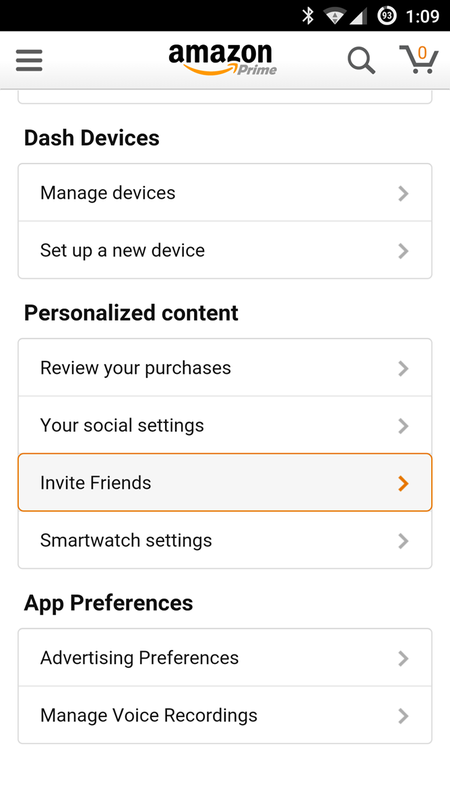 Offer applies to customers who have not completed a purchase using the Amazon App in the preceding 12 months, who access the Amazon App for iOS, Android, or Fire OS, and who link their account to a phone number that has not received a promotional credit or purchase discount during the lifetime of the program. After signing into the latest version of the app and verifying your phone number, you will receive an e-mail or SMS from Amazon.com indicating that a purchase discount of $5 off a purchase of $10 or more at Amazon.com has been applied to your account. 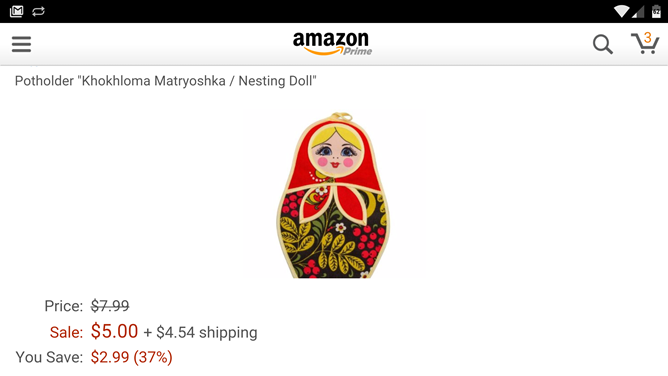 Purchase discount only applies to products sold by Amazon.com and cannot be used to purchase gift cards or to pay shipping, handling, taxes, or any other applicable transaction costs. We may specify other products that are ineligible from time to time. Purchase discount will be valid for 90 days from the date it appears in your account. Purchase discount is valid for one-time use only, and is non-refundable - if you use a purchase discount to purchase a returnable item and you return that item, the amount of the discount you received will be deducted from the total amount of the refund. This offer is limited to one per customer and account. Seven days or more after the referred customer's order is shipped, you will receive an e-mail or SMS from Amazon.com indicating that a purchase discount for $5 off a purchase of $10 or more has been applied to your account. The purchase discount will be valid for 90 days from the date it appears in your account. The maximum amount of purchase discounts you are eligible to earn is $1000 per calendar year. Purchase discount will be automatically applied to your Amazon purchases at checkout in the order in which they expire (i.e., first to expire will be applied first). Each purchase discount can be redeemed only on items sold by Amazon on Amazon.com, is valid for one-time use only, and is non-refundable - if you use a purchase discount to purchase a returnable item and you return that item, the amount of the purchase discount used by you to pay for the item will be deducted from the total amount of the refund. Purchase discounts may not be combined with other offers or discount codes. You may not use purchase discounts to buy gift cards or to pay for shipping, handling, taxes, or any other applicable transaction costs. We may also specify certain products that are ineligible for payment using purchase discounts from time to time. Purchase discounts are issued to a single Amazon account at our discretion and cannot be transferred, bartered, or sold. Participation in the Program may require you to submit personal information about you and the customers you refer, such as name and email address. You agree to receive communications from us with regard to your participation in the Program, and to allow us to communicate with referred customers about your participation (for example, by disclosing to them that an invitation was sent by you). Any information collected from you or your referred customers as part of the Program will be subject to Amazon's Privacy Notice. If you participate in an Amazon affiliate marketing program, including Amazon Associates, you will not receive a purchase discount on any transaction for which you receive affiliate advertising fees. Participate in the Program if doing so would be prohibited by any applicable laws or regulations. We reserve the right in our sole discretion at any time and without prior notice to you to add to, remove, or otherwise change these terms, including, without limitation, by changing the amount of the purchase discount, modifying how you may earn and spend purchase discounts, modifying the duration and expiration of purchase discounts, requiring or modifying minimum purchase amounts for use of purchase discounts, changing the maximum amount of purchase discounts that you may earn, and discontinuing the Program entirely. We will post an updated version of these terms in the Amazon App, and you will be deemed to have accepted such changes by continuing to use the Amazon App or to participate in the Program after the date such changes are posted.